Ceramic floor tiles are either unglazed or glazed and sport ridges along the back of each panel to help the bonding process. Unglazed tiles are not as common and are sometimes referred to as quarry tiles. The color typically remains the color of the clay used to make the tile. The positive to unglazed tiles is that they don’t scratch. The negative is there’s no finish to the surface, so stains are tougher to remove. Glazing provides the decoration to the otherwise dull natural color of the clay that’s been fired into becoming a ceramic tile. Glazing also creates the shiny, satin, or matted look to ceramic tile, and can be finished with either a smooth or textured feel. Glazing allows ceramic to become waterproof and virtually stain proof. Porcelain tile is made up of 50% feldspar and is fired at a much higher temperature than regular ceramic tile. This makes porcelain tile much harder and denser than other tile products. 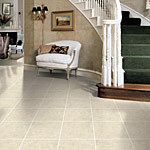 Their high performance, stain resistance, and natural stone looks make these tiles a great choice for your home. Stone can be tricky to purchase, because by their nature, all stones are unique in appearance and therefore, variation is shade and coloring are to be expected. Maintenance is the key to keeping your stone floor as beautiful as the day it was installed. Because most stone products are porous, a sealer is recommended and can be applied after installation. Today’s grouts are designed to be stain resistant; however, they are still more prone to color changes than any other part of your floor. In general it is wiser to use midtone to darker tone grout colors in active areas that are more susceptible to wear, dirt and spills. When choosing a grout most decorators will recommend using complementary or contrasting colors to either coordinate with your tile or to set it off visually. There are over 80 different grout colors to choose to use with your tile, so be sure to consult with our staff on what colors will work best with your home and your tile selection. In addition, you can help protect your grout color by adding a grout shield to your order. Typically a spray-on application, these shields can help preserve your colors. Grout shield can usually be purchased as an add-on to your tile order or can be applied periodically over the life of your tile floor. Spray-on grout shields are easy to apply and provide an extra level of protection for your investment.